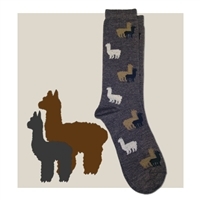 Multicolored alpacas, both adults & crias, graze in a pattern across this wonderful new crew sock. Great for farm animal lovers of all kinds. Softest blend of baby alpaca / viscose bamboo. Machine washable & machine dryable. Made in Peru.